A cable car seen from Pão de Açúcar (Sugarloaf Mountain) in Rio de Janeiro, Brazil. Photo by Phillie Casablanca. Cable cars, also known as ropeways or aerial tramways, don’t get much respect. These types of transportation systems, in which a cabin or other conveyance is suspended from a fixed cable and pulled by another cable, are often thought of as tourist-movers. But cable cars can have some practical applications in urban settings. They are especially useful where inclines are too steep for conventional mass transit and where they can serve as feeders to bus and metro systems. They have been successfully applied in growing cities of the developing world, where slums are often clustered on precipitous hills surrounding urban centers. They are a low-emissions form of transportation, as their motion generates less resistance than land-bound transport, so less electrical power is required to drive the ropes. Additionally, less energy is required for start-up because they move continuously. Their aerial position means they can be readily integrated into the cityscape and combined with other elements of the public transit network without encountering obstacles on the ground. They don’t compete with traffic. They provide no-wait service, moving continuously without interruption. Service frequency can be adjusted to suit demand by varying the speed of the circulating rope, eliminating empty runs in off-peak times and waiting times during peak periods. They are accessible to passengers with impaired mobility and wheelchair users because the cabin floor is level with the platform. They can be equipped with wireless connection allowing direct audio/CCTV communication between cabins and stations. Critics note the potential safety issues presented by cable car systems. In the case of an emergency, such as a power outage, passengers will be stranded in the cabins. The Medellín system is addressing this issue by providing a communication system in every cabin should an emergency occur. 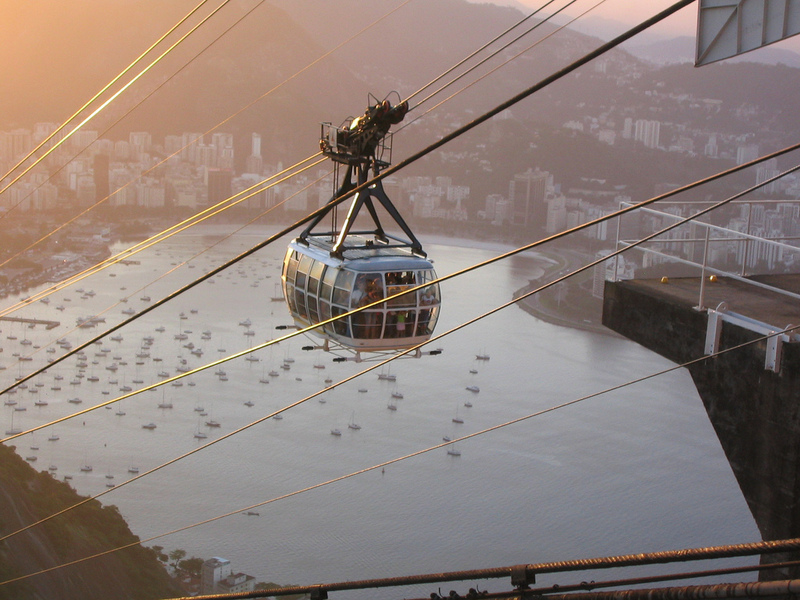 Below we describe several examples of cable car systems. 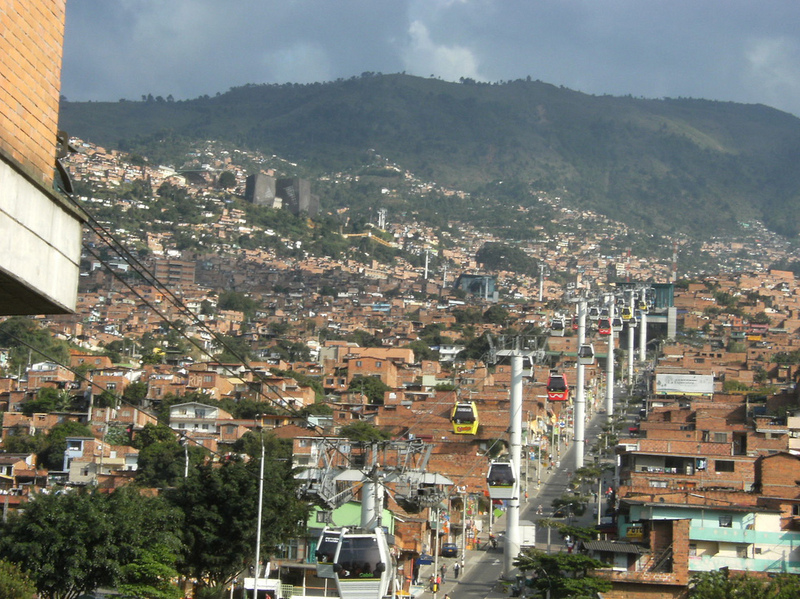 Medellin's Metrocable connects residents of the poor hillside barrios to the rest of the city, something conventional transit can't do because of the steep slopes. Photo: joshuaheller. Medellín, Colombia’s gondola lift system, called Metrocable, provides a complementary transit service to Medellín’s Metro. In fact, Metrocable is a branch of Metro, and both are managed by the same corporation and can be used for a single fare. Metrocable has also become popular among tourists because of its spectacular views of the valley. The newest line was inaugurated in February to connect tourists and locals to Park Arvi, a nature reserve just outside Medellín. The new line is expected to improve security in the area, reducing the presence of paramilitaries and guerrillas. It will also provide residents access to open space, something they don’t always get much of. In Algiers, Algeria, a cable car facilitates travel between the modern part of the city built on the level ground by the seashore and the ancient city on a steep hill. It serves as a connection to other mass transit modes, and brings tourists to Notre Dame d’Afrique (Our Lady of Africa), a Roman Catholic church on a cliff overlooking the Bay of Algiers. 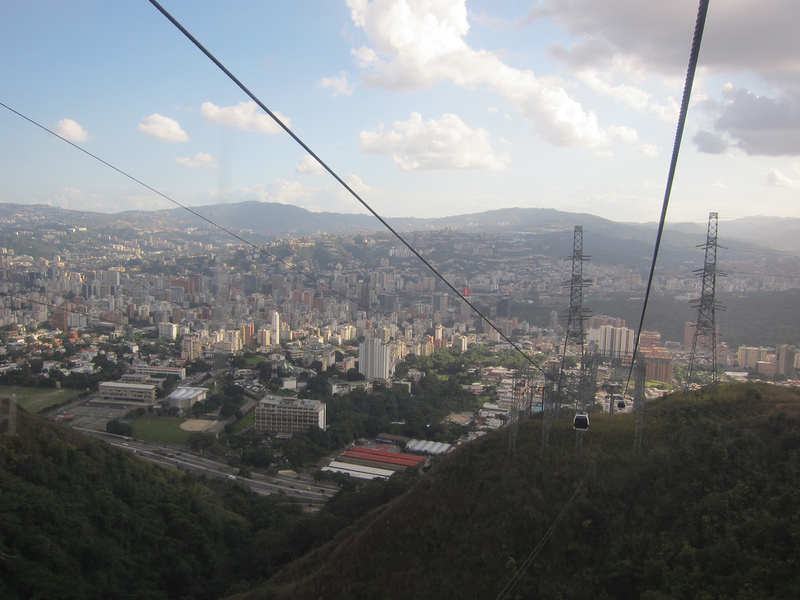 Caracas' cable cars provide transit connections to barrio residents and tourists alike. Photo: allert. Like Medellín, Caracas, Venezuela is in a valley surrounded by hills. Many residents live in the poor barrios in the hills and work in the valley. In its heyday in the mid-1900s, the city’s cable car connected Caracas with the Caribbean coast on the other side of the mountains. But the system was closed in 1988, and it was not until a few years ago that the Caracas side reopened. (For a more detailed history, see this travelogue in the Economist). Today, the teleférico carries passengers to Avila Mountain, a national park, and as it’s integrated with the Metro system, eases the commutes of barrio residents. After being closed for more than a year because of security concerns, Taipei's Maokong Gondola reopened to the public in late-March 2010. Photo by ddsnet. 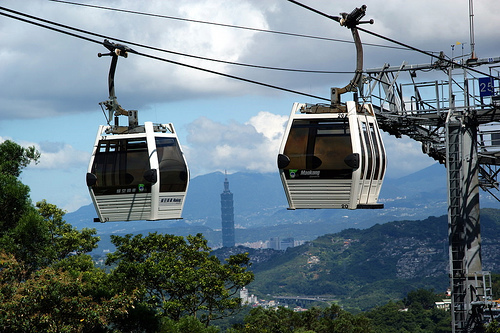 The Maokong Gondola in Taipei, Taiwan opened in 2007 to connect passengers from Maokong, a popular tea-tasting destination, and the Taipei Municipal Zoo, located high up in the city’s surrounding hillsides. The system was designed to ease traffic over the mountains and shorten travel time. But the system has been controversial. The cable cars were suspended for more than a year following damage to the support pillars caused by typhoon-related mudslides in 2008 . The temporary closing affected local small business owners, whose revenues dropped nearly 90 percent over the past 18 months, according to one news report. Other problems have included lightning strikes, noise pollution, poor ventilation, and other technical glitches. Critics of the system cite weak management and government inefficiency. “What should have been a good thing has become a mess,” wrote Ko Cheng-en in an op-ed piece. The system finally re-opened at the end of March 2010, attracting large crowds with free rides and a cable car with a glass floor, suggesting that the system has become less of an everyday mobility solution and more of a tourist attraction. Nonetheless, there’s no doubt that the Maokong Gondola has improved accessibility to some of the city’s previously hard-to-reach destinations.